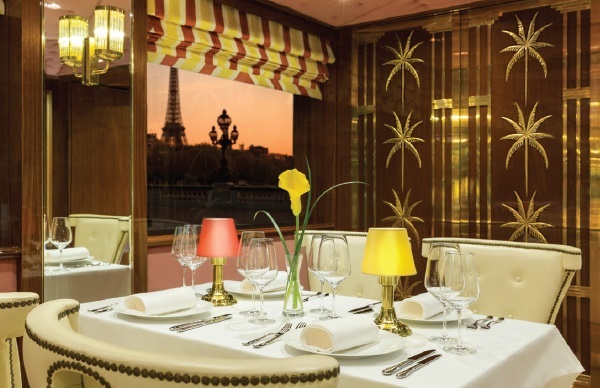 Launched in Paris with Hollywood pizzazz, Uniworld’s latest ship takes river cruising to amazing new heights. to the elegant floral displays, we could feel the anticipation in the air. 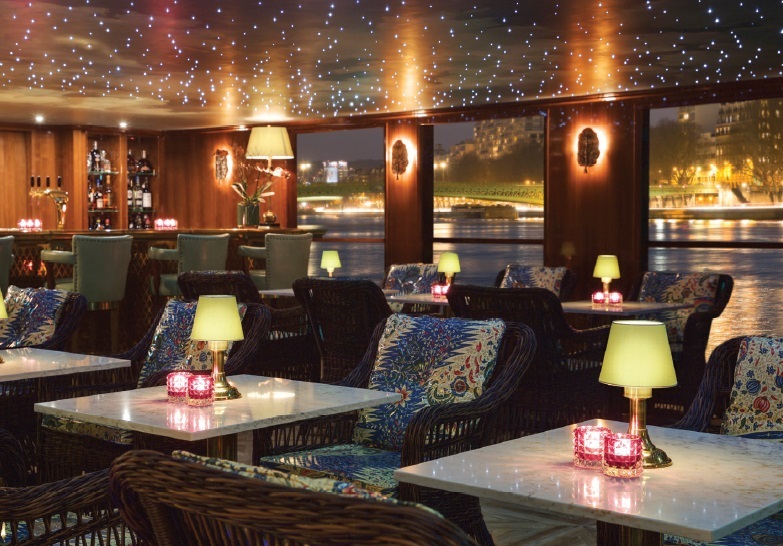 This dazzling vessel (Joy of Living, to we Anglophones) is the latest addition to Uniworld’s river fleet, described by the company as “one-of-a-kind ships, as inspiring as the destination”. 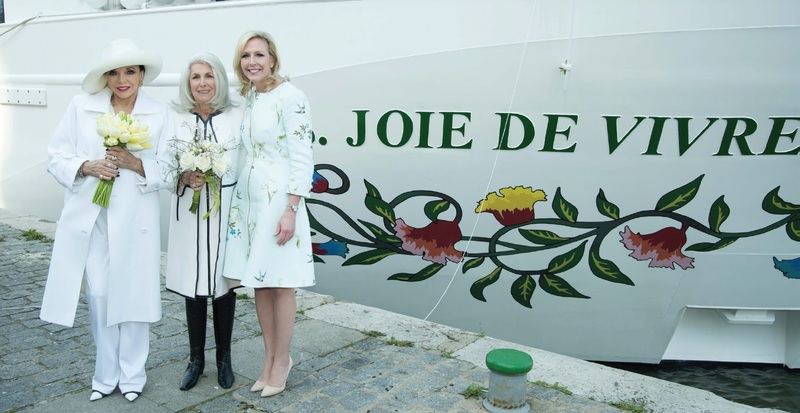 Joie de Vivre will sail the Seine from April to October each year, and along the way she aims to immerse her guests in all things French. Step aboard and you soon appreciate the extraordinary dedication and attention to detail that implies. Featuring handcrafted furniture and fine antiques, original artwork and inspirations from twentieth-century Parisian design, her interiors are simply stunning. 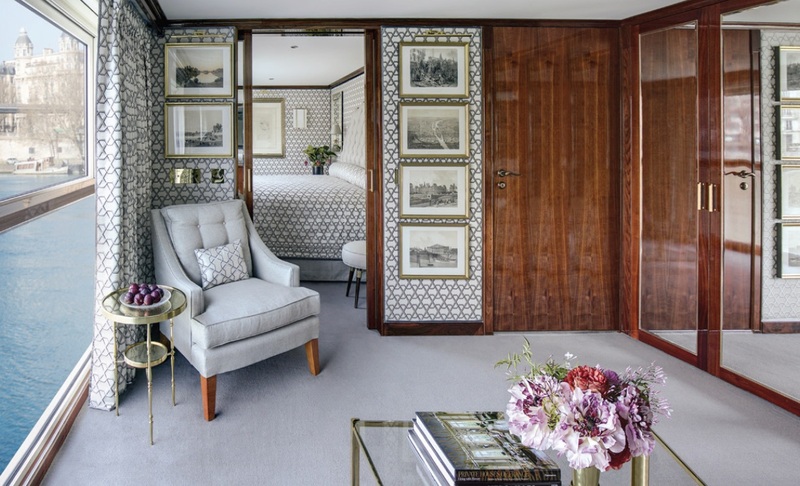 Walk into one of the 54 staterooms (or, if you are fortunate enough, one of the two Royal Suites or eight Junior Suites) and you will find that it’s individually decorated, but in an unmistakably Gallic style. The bathrooms are marble-lined, and stocked with L’Occitane and Hermès products. Even the standard rooms, though smaller, are well laid out and perfect for a couple spending a week on the river. Each has 6ft-wide, floor-to-ceiling windows that open at the touch of a button. Curtains, too, operate electronically. The chic and sophisticated superyacht effect continues as you relax in the Salon de Toulouse – the main lounge – with its sumptuous settees and chairs, along with a baby grand piano and a variety of French artwork. Passing a magnificent polished wood bar (generously stocked with fine wines, Champagnes and premium spirits, most of which are complimentary for Uniworld guests), you pass into Le Bistrot. 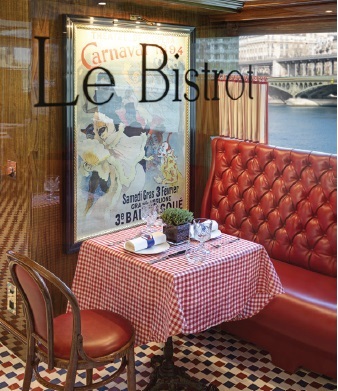 As any Francophile would expect, fine dining is at the heart of the Joie de Vivre experience, and Le Bistrot is the place to enjoy some traditional French pâté, or perhaps a Parisian sandwich, washed down with a cold glass of Chardonnay – all served in a delightful but relaxed atmosphere. Venture aft, down one of the lavishly decorated corridors and, depending on the time of day, you will arrive at either Club L’Esprit spa, or Claude’s Supper Club. Yes, in a dazzling “visage à deux” transformation, the onboard spa and wellness centre, complete with its elegant resistance pool, turns into a glitzy and glamorous evening venue. As if by magic, the pool disappears under a wooden floor, and the scene is set for guests to enjoy authentic French music while nibbling hors d’oeuvres and quaffing cocktails, and on selected nights viewing a classic French film. Restaurant Pigalle is perhaps the pièce de resistance. Creative geniuses work behind the scenes to produce some of the finest cuisine I have ever had the pleasure to enjoy, on land or water, with a wide-ranging menu that changes daily. There is open seating for breakfast, lunch and dinner, and in various arrangements so you can enjoy an intimate dinner with a loved one, or perhaps widen your social reach and join other passengers at a larger table. But I’m getting a little ahead of myself. We were here to see the ship christened – by Dame Joan Collins, no less – and to pay tribute to the extraordinary vision of the Tollman family. Stanley and Beatrice Tollman, both now in their eighties, created The Travel Corporation, which is behind leading brands such as Trafalgar Tours, Insight Vacations, Contiki, AAT Kings, Red Carnation Hotels and some 25 others, including Uniworld. Between them, the corporation’s businesses employ more than 10,000 people in 60 countries, providing over 1.5 million holidays per year. As he proudly introduced his newest arrival, Mr Tollman talked us through more than 50 years of this remarkable story. Then it was time for the star of the show, who needed little introduction as she took to the stage under a barrage of cheers and flashing cameras. A living epitome of “Joie de Vivre”, Dame Joan poured a glass of Champagne over the ship’s bell – a maritime tradition – then cut the ribbon, sending a bottle (more like a Jeroboam) of Champagne crashing over the bow. I managed to exchange a few words with the elegantly dressed screen legend, who led the conversation and was very keen to know who I was and whether I was enjoying the ship. Back on board, we attended a reception where we heard some more fascinating stories from Mrs Tollman. Beatrice started her career as a nursery school teacher, but she and her husband then acquired their first small hotel. She cooked the food while he worked the front office – and from there they built the multinational corporation we know today. Beatrice has retained her love for cuisine, and has written a number of cookbooks, many of her recipes being used across the multitude of travel businesses they own. Later we learned that this remarkable lady still rises at 6 o’clock every morning, takes her dogs, Milo and Honey (also on board, staying in their own suite) for a walk, and then gets down to a full day’s work. Over the past 50 years the Tollmans have made their business a true family affair. Children Brett, Toni and Vicki all have senior positions and are equally committed to the company’s ethos of providing exceptional holiday experiences. To that end, Uniworld’s varied and inclusive excursion programme takes care to connect with the local culture and sights of Northern France. Guests can explore local historical sites, take culinary tours and enjoy sporting trips, including golf at the area’s finest courses. A great example of the Uniworld approach to shore excursions was our tour of the Palace of Versailles. After a short coach journey, listening to commentary from a knowledgeable guide, we arrived at the amazing town of Versailles and rather smugly walked past the huge queue to enter the grounds of this famous palace. Then, dodging more crowds, we were taken on an exclusive tour of the private quarters of Louis XIV, XV and XVI. Finally it was back to the ship – and it’s high praise to say that it seemed only a little less palatial than the famous home of the Bourbon kings. Vive la France, bien joué Uniworld, et bonnes vacances mes amis! Eight-day Paris & Normandy cruise on SS Joie de Vivre, departures April to October, prices from £2,489pp (includes all meals and beverages on board, as well as excursions and transfers). See RiverVoyages.com or call 0800 107 1131.